PFC4 captive panel screws will install successfully in stainless sheets as thin as .060” / 1.53mm with hardness up to HRB 88. A shoulder provides a positive stop during installation and the fastener ultimately will be flush on the opposite side of the sheet for a clean and unmarred appearance. A fully recessed head in the fastened position allows for tool-only access. The fasteners are manufactured from 400 Series stainless steel providing corrosion resistance comparable to zinc-plated steel. They are available in assorted screw lengths and in thread sizes #4-40 through #10-32 and M3 through M5. 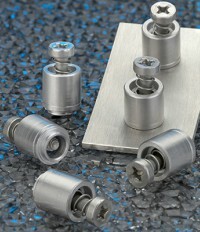 All PFC4 fasteners are RoHS compliant. Among options, designers can specify MAThread® anti cross-thread technology as a safeguard to correct off-angle thread mating and promote proper alignment during installation. A Torx® recess offers an alternative to the standard Phillips drive. PFC4 captive panel screws are part of a growing family of PEM® access hardware solutions. Detailed specifications, fastener drawings and 3D models, and performance data (Bulletin PF) can be viewed and downloaded for free at www.pemnet.com.